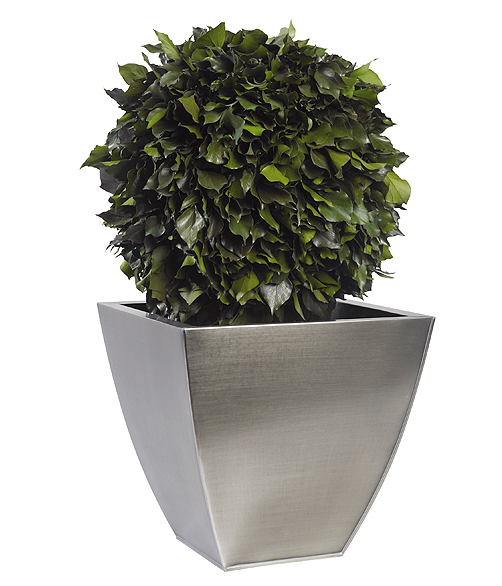 This month of June we here at Verdissimo, the largest producer of preserved flowers and plants, have decided to pay homage to one of the most popular trees in interior décor: Topiary Hedera. In this article we’re going to tell you everything we know about this tree: its characteristics, its uses in interior décor, and much more. You won’t want to miss this one! Hedera, commonly known as ivy, belongs to the Araliaceae family, and there are 15 different species. Its leaves are a bright green color, which makes them perfect for decorating all sorts of spaces. With respect to what they symbolize, we should point out that this plant is linked to immortality and is often associated with ancient Greece due to the vast quantity of representations of it that have been found on clay vases from the period. Living room: in the living room you can create a nice, relaxing reading corner. To that end, we recommend using Topiary Hedera along with a nice armchair and a coffee table made of natural materials, such as wood. This rustic aspect of the coffee table will be balanced by the freshness provided by the plant, which is perfect for creating an environment that invites one to enjoy a moment of total peace. Dining room: if you’re the type of person who doesn’t like to clutter up your dining room with too much furniture or if you feel like your dining room lacks a certain chic touch, we recommend placing Topiary Hedera in this space. It’s usually convenient to place it in a corner of the space so as to not interrupt the flow of foot traffic. Indoor patio: what’s an indoor patio without a plant? This trend of creating indoor gardens at home comes from the orient, but we have diverse options of plants and trees for you, and you’re not limited to any one style of décor. We love placing an Topiary Hedera on a base of stones to decorate this type of space. Bedroom: bedrooms are a place of rest, the space where we go in search of peace and recuperation from our daily toils. Floral décor plays a very important role here since flowers, plants, and trees provide a lot of serenity. The tree that we’re talking about right now, Topiary Hedera, is perfect for a boho-chic style if you combine it with linens or colorful objects, or you can use it for Scandinavian décor if the colors in the space are very neutral.